According to some local stories it had 99999 shivalingas in its original form. This myth is somewhat similar to that of Unakoti in Tripura which is believed to have one less than a crore statues. If Unakoti is rarely visited owing to its remote location, Sri Surya has been completely sidelined by a society of philistines. In fact, most of the experts believe that many of the lingas worshipped by people are actually Buddhist stupas. Certain other not very clear statues have striking resemblance with known sculptures of Jain tirthankars. So, overall, Hindus, Buddhists, and Jains consider it to be an important site although nobody is exactly clear about its history. There is no doubt about it’s antiquity and it can be the oldest known archaeological site belonging to an era we know nothing about. Not many have heard of it even within Assam but as a matter of fact it is the single most important archaeological site in Assam that deserves volumes of research work to be written about. 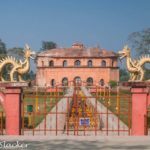 Sri Surya is located in the Goalpara district on the southern bank of Brahmaputra, in western Assam closer to Bangladesh border. In terms of socioeconomic aspects, these areas are some of the least developed in Assam and practically there is no tourism scene to speak of. I visit the area once in a while because one of my maternal aunts live here along with some other distant relatives. So, I have visited the temple thrice, third time in last February. I have always wanted to write about it but I somehow could not get the right photographs on the previous trips and so I resisted myself. But now I do and so, I must do it now. Like most other major archaeological sites of ancient Assam, Sri Surya is located above a series of hillocks not very far from the Brahmaputra which can be seen from the top of the hillock. Considering its location, it can easily be imagined to be a major city of the ancient times. It was probably also a prosperous trading center near the river. I am sure that many more treasures are still buried underneath but the the few excavations by the ASI has resulted in enough evidences to suggest that this was not just a solitary temple but a combination of Hindu, Buddhist, and Jain shrines, a thriving multi-religious melting pot akin to Ellora although the artifacts are not as detailed or sophisticated. In fact I am not aware of any other site in Assam that has Jain connections. As one might have guessed already, exact history of this site is not known. Looking at the expanse and diversity, it can be guessed that they were built over several centuries by different patrons. Some apparent references to the site can be found in in 9th and 10th century religious texts so it must be older than that. In fact certain Buddhist remains suggest that they are close to 2000 years old (The reason will be explained in a later paragraph). Nevertheless, this makes it older than the oldest known historical reference of Assam (4th-5th Century). Various important remains are spread around a large area and one should have at least 3 hours in hand and a willingness to climb a lot of stairs under the blazing sun for a complete survey of the hills. Apart from Hindu shrines, Buddhist stupas and even the remains of a Vihara has been found here. Certain structures cannot even be fully explained and I guess they are salivating prospects for anyone who is willing to explore more. Have a look at the photographs below for a better idea. The name of the place suggests sun worship however, there is no conclusive evidence for the same. One of the excavations resulted in an artifact that somewhat looks like the sun. We were told that the original artifact has now been moved inside the museum situated nearby and a replica is placed inside a newly built temple. As faith always trumps reason in this society, visitors gleefully offer prayers in front of the replica. The more interesting aspect of Sri Surya was the willingness of the devotees to believe whatever they want to believe as per convenience. For example, most of the votive stupas are now considered to be Shiv Lings by the pilgrims as they look somewhat similar in shape. Similarly, certain apparently Buddhist and Jain caves have been adorned with saffron flags and are passed off as Hindu shrines although the ASI markers clearly state otherwise. This time, we visited it in February when a local fair was going on on the grounds in front of the hills. From what I could figure out, it started many decades ago by an ascetic who meditated here. Nowadays it attracts a huge number of local visitors and it may be a rare form of entertainment for many. While I have no problem with that in spirit, this also provides an opportunity for many commercial holy men to set up their business here for a few days. Some of them could be seen taking residence in some of the caves and runing the views with unwanted temporary structures. Anyway, coming back to the point, what disturbed me throughout these visits is the sheer information vacuum. We don't exactly know who built them. Some educated guesses can be made and it can be connected to other remains of the first millennium but still certain questions remain difficult to explain. The austere looking votive stupas here are generally associated with Hinayana sects and this makes most experts believe that they were built during the early Christian era. More detailed Mahayana sculptures are not to be seen here and this probably indicates a phase in Assam that does not find mention in any history books. To make it even more poetic, there is a large tree that looks somewhat like the Bodhi tree in front of one of the excavated ruins. There is no information available about this so use your own imagination. Most puzzling are the Jain remains because Assam is not really known to have any Jain connections back then and the most prominent Jain community in present-day Assam are the traders from Rajasthan who moved here in the 19th and 20th century. Anyway, some of them probably have realized the importance of this site and so some new marble statues of Jain tirthankaras have been built at an open space in front of the hills although I am not sure if this does any justice to the archaeological treasures here. How to Reach Sri Surya Pahar? It is around 124 KMs westwards from Guwahati. The nearest towns are Goalpara and Dudhnoi. As the spot has not been developed as a tourist destination, you are unlikely to get any direct transport. We went on private vehicles every time. It is not far from the Brahmaputra river and the Naranarayan Setu. What is the best time to visit Sri Surya? It can be visited anytime but better to go in the winter as the rocky hillocks heat up very easily in day time. Season-wise, winters (Nov-Feb) are always better and easier for travel in Assam. Who should visit Sri Surya? Only if you are deeply interested in history and archaeology. Otherwise you can give it a pass. Jitaditya , Great to read your post on Sri Surya Pahar, I visited the place few years ago. Beautiful site to visit ! !